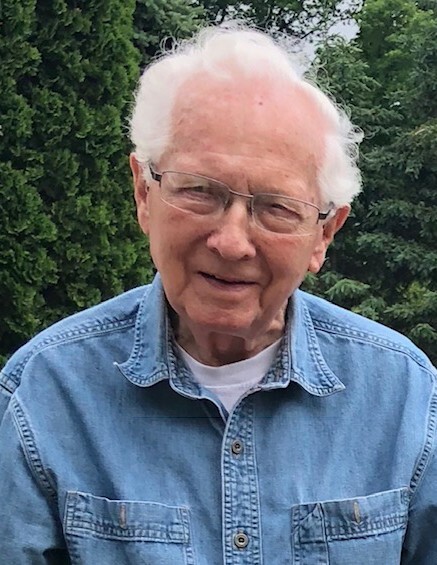 Robert C. "Bob" Erickson, age 90, of Shelby, passed away Friday, January 18, 2019 in Muskegon. Bob was born in Muskegon on February 7, 1928, the son of Orville and Ferrol (Bearss) Erickson. He was raised in Shelby. He served in the U.S. Navy from 1946 to 1948. Bob married Joan Current on June 10, 1950. He was a lifelong resident of Shelby. Bob was employed at the Sunoco Station in Shelby and was a butcher at Kroger in Whitehall before working at DuPont. He was employed there for thirty-three years until his retirement. Bob was a member of the Shelby V.F.W. He enjoyed family times, his dogs and birds and nature. He is survived by his wife, Joan; his children, Denise (Tom) McCarty, Carol Babinec, Susan (Jerry) Selkirk-Merren, Bob (Debbie) Erickson, Chris Erickson and Jeanne Erickson; eighteen grandchildren; and many great-grandchildren. He was preceded in death by his son, John, his parents and his brother, Douglas Erickson. Visitation is Monday, January 21st, 10 am until the funeral service at 11 am at Harris Funeral Home in Shelby with Pastor Dan Barnum-Steggerda officiating. Interment will be in Mount Hope Cemetery in Shelby in the spring.